The Board of Selectmen have adopted a charge for the building committee that will oversee repairs to Penfield Pavilion, damaged in Superstorm Sandy and closed ever since. 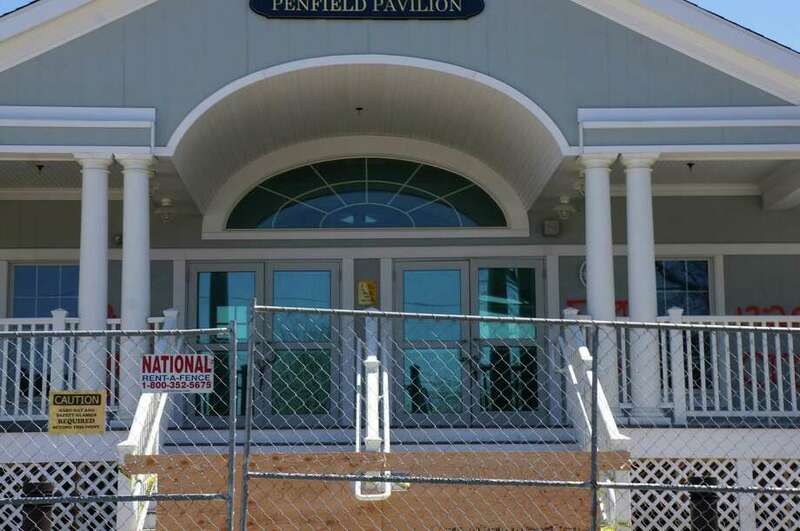 A "charge" to the committee that will oversee rebuilding Penfield Pavilion was approved by the Board of Selectmen last week, but officials still want to hear the public's ideas about what to do with the storm-damaged waterfront building. The pavilion has been closed since last October when it suffered severe damage to its footings from Superstorm Sandy. Town officials have been reviewing three options for the structure: make repairs with no elevation of the building; repair and elevate the building, or repair, elevate and move the building farther from the water and into part of the parking lot. Costs have not been formulated for any of the options, and members have yet to be appointed to the new building committee. At a public forum this summer, some residents suggested the glass-fronted pavilion, -- housing a gathering room can be rented for private events, a concession stand, lockers, bathrooms and showers -- should be replaced with a much simpler structure. The charge approved for the building committee by the selectmen calls for the panel to hire design professionals, including a structural engineer, coastal engineer and geotechnical engineer. It should take into consideration engineer reports, Federal Emergency Management Agency standards and guidelines, flood mitigation plans, neighborhood concerns and public comment before deciding which repair option to adopt. Once that is done, the committee must organize the scope of the work, estimate the costs and request appropriate funding. The building was insured and there is a $500,000 deductible, although officials expect that some of that deductible may be reimbursed by FEMA. Selectman Cristin McCarthy Vahey questioned whether there should be designees from the finance board and the Representative Town Meeting named to the building committee. "Any one of those boards can be a member of that committee since it's a temporary committee," First Selectman Michael Tetreau said, but added he was reluctant to make it a requirement since those board members are already volunteering considerable time. Tetreau has posted the charge to the committee on the town's website, www.fairfieldct.org, and is seeking feedback by Nov. 1. The charge will be reviewed for a third time at the Board of Selectmen's Nov. 6 meeting.